I bought the single because I love Change the World, then I heard Danny Boy for the first time. If you are a Clapton fan this song is a Must Have, it is haunting yet you feel the emotion of this old Irish ballad. It is a song you will play over and over, it's as emotional as the late Ray Charles version of America the Beautiful. Both songs will give you chills, Buy It. I'm told that this Clapton CD is out of print but I searched the web and found about 6 other copies so I bought one for a back copy just in case, that's how great it is. Good luck in your search. 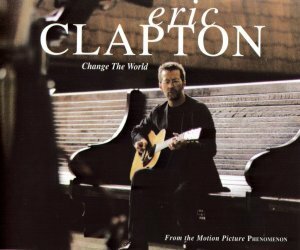 Change the World is one of the classic songs of Eric Clapton's career. The thing about this single is the "B" side. Danny Boy is probably Eric Clapton's finest hour. His version of Danny Boy is haunting. I find myself playing it over and over. His interpretation of the song gives it a new life. I believe its should be on his Greatest Hit album "Chronicles" as well. Change The World is pretty good, but Danny Boy is unbelievable. I've been trying very hard to find it, everyone laughs at me when I try and buy it. This could be EC's best song of all time, his voice is so smooth and mellow, his guitar fluid as always. The song was produced by Babyface, who I really like too. Its a great mix of Babyface's R'n'B and EC's pop / rock style. EC sings and plays with confidence and sounds happy playing it. The song isn't over produced it has the right balance of everything, not all songs have the perfect mix. You don't even have to be an EC fan to love this one...fantastic. On the B- Side is an instrumental of 'Danny Boy'. This is the best acoustic instrumental you will ever hear, such emotion and all the notes are fluid, its like his guitar is singing the actual verse.....amazing.